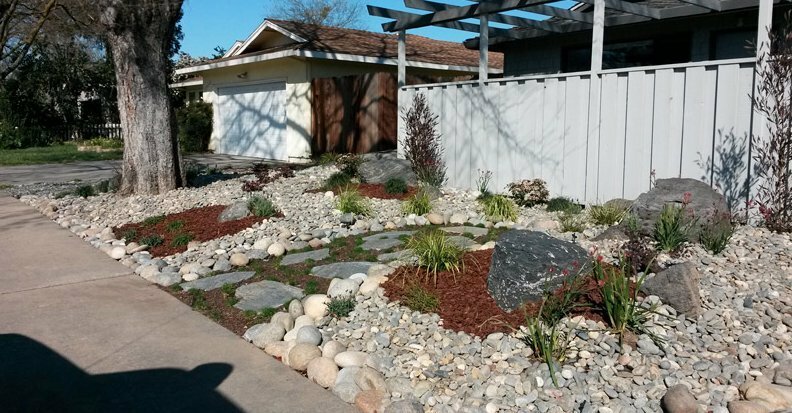 Transform your home with a typical California rock or gravel landscape! Using Rock To Enhance Your Landscaping! You want to give your yard an uplift but you are not sure how. So you contact your local landscape architect and they suggest rocks landscaping as an alternative to grass or other lawn cover. It sounds interesting. No more mowing the lawn or watering. Less work once it is done and less money to maintain. You start checking into it and you find there is a variety of rock or gravel landscaping that can be used to design beautiful designs and patterns throughout the entire yard. For driveways, walkways and patio areas you might consider using paving stones made up of flagstone or other types of appropriate flat stones. You discover you can turn your boring traditional “soft landscape” with lawn, trees and shrubs into something more contemporary using new materials. It may not be necessary to remove completely all soft landscaping but rather to complement what you have with a combination of rock, gravel and flat stone. Perhaps you will use a combination of both, for instance, in your flowerbeds. In your flower garden, you can use small pebbles in place of mulch and different flowers can be separated with different colored pebbles. Larger rocks can be used as borders around trees and shrubs or along the walkways, which might include paving stones or flagstone. Once you have your design, and an idea of what type of hard landscaping materials you need, you then need to begin shopping in order to create a budget you can live with. You need to keep in mind how any up front cost for new material may be offset with smaller maintenance bills down the road. Because of the broad range of hard landscaping material, choosing the correct product might be a little overwhelming or confusing. If you are doing your own landscaping, remember to select materials that will go well with the site. Highly reflective materials are not ideal for areas that get a lot of sunlight. There are also certain pavers that are suitable only for light foot traffic. You also need to make sure whatever materials you choose are compatible with the weather in your area. Just ensure that the hard landscaping materials will work together to truly enhance your current surroundings. Your goal is to find balance and harmony with every aspect of your project that not only matches your house, but enhances the look of your neighborhood as well. By taking this bold step, you now can become the envy of your neighborhood and, who knows, perhaps they will follow your lead.